The fourth instalment in the Jurassic Park series has become the first film to take more than $500m at the box office on its opening weekend. Jurassic World was the most popular screening in all 66 countries where it was released. The film made $204.6m (£131.4m) in the US, according to the firm Exhibitor Relations. It took $100m in China and $29.6m (£19m) in the UK and Ireland as part of the record global total of $511.8m. The Universal Pictures release had the second-highest grossing opening weekend in the US. The record is held by Marvel's The Avengers, which took $207.4m in 2012. 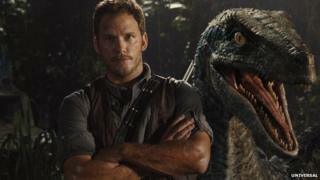 But Jurassic World could still dethrone the comic book film, as the weekend figures are partially estimated. The final tally will be revealed later on Monday. Jurassic World was co-produced by Steven Spielberg, who directed the first two films in the series, and directed by Colin Trevorrow. It stars Chris Pratt and Bryce Dallas Howard. Jeff Bock, a box office analyst with Exhibitor Relations, told Variety.com: "People should call dinosaurs the original superheroes. They are just as big as Iron Man or Superman or Batman right now." Jurassic Park was a major worldwide success in 1993, taking more than $1bn globally. It was followed by The Lost World: Jurassic Park four years later, and Jurassic Park III in 2001. The third film got poor reviews and made far less than its predecessors. Analysts say the success of the latest movie will vindicate the decision to reboot the franchise for a new generation of dinosaur fans.